1st Lt. Jennifer Wain is a nursing student at Rutgers School of Nursing-Camden. Ask almost any combat veteran about their transition back to civilian life and they will tell you how overwhelming it can be. As a matter of fact, they might have a hard time articulating their experience. After adjusting to the intense military environment of deployment, their sense of identity and alienation from the rest of society upon return can feel inexplicable. Every veteran’s story is unique, but an unfortunate common ground for many is their sacrifice, whether it is the deterioration of prior relationships, the devastating loss of brothers and sisters in arms or some part of themselves in mind or body. With such an immense weight on their shoulders, an educational environment has always been seen as a beacon of light and a way to reconnect with society and personal goals. Rutgers University-Camden exemplifies this through its dedicated programs and services. 1st Lt. Jennifer Wain is currently a junior nursing student at the university and works in the Veterans Services Office on campus as the vice president of Student Veterans. With a prior degree in biology, she has always found research enthralling, and it is what continues to drive her passion for nursing today. She also greatly appreciates Rutgers-Camden for supporting its students with new resources like the upcoming Nursing and Science Building, which opens this spring. Before enrolling in the Rutgers School of Nursing-Camden, Wain was the first female combat arms officer in the history of the New Jersey Army National Guard and, thus, is well-acquainted with facing challenges. Not only is she a groundbreaking veteran, she is engaged in successfully transitioning from active duty to civilian life through attending college. She understands through experience the necessity of finding a welcoming civilian environment in which to thrive. “At other colleges, I was just a number. My professors didn’t know my name. Here, they want to engage you. You feel more motivated to study and do well because they know you. They know your face. They know how you are doing. They know your weaknesses and strengths and they help you any way they can,” she shares. 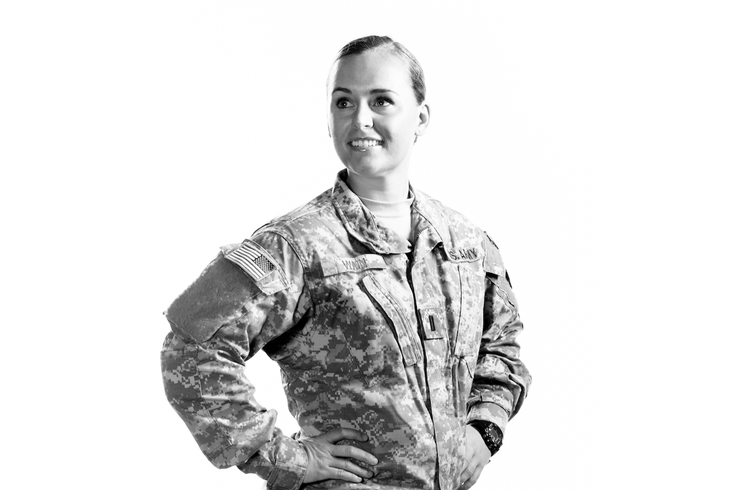 In the Veterans Services program, she and others work closely with veterans to pass these ideals on and help them get the most out of the benefits for which they are eligible. They ensure a comfortable space for veterans to connect and check up on each other, like at a lounge and hosted luncheons. Wain points out that in her experience, very few college campuses are military friendly, but Rutgers-Camden has proven itself to be exceptional and has been named New Jersey’s only Purple Heart University by the Military Order of the Purple Heart. Rutgers-Camden also is ranked consistently as a Military Friendly School by the magazine G.I. Jobs. With the help of an environment to thrive in, Wain has been able to gain a better understanding of herself and her purpose in life.